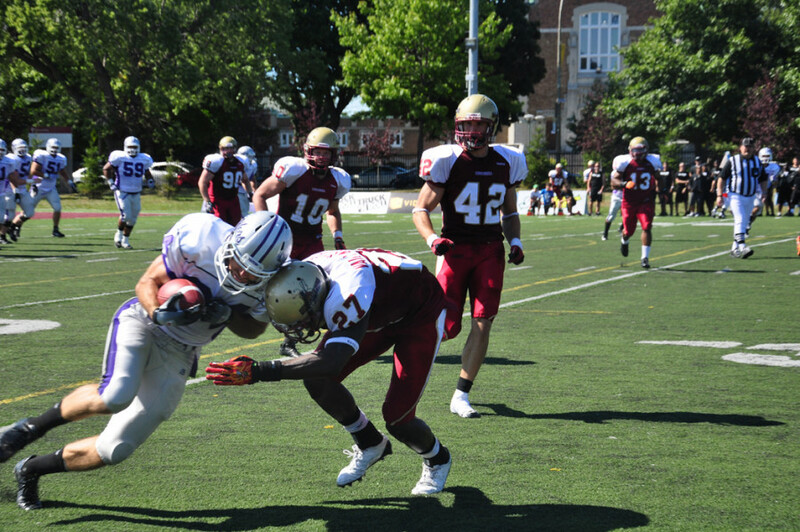 The Concordia Stingers football team started their season off on the right foot with a 42-36 victory over the Bishop’s University Gaiters Saturday at Concordia Stadium. In a contest that featured an inordinate number of flags, several early-season gaffes and a lot of nervous pacing on both sidelines, the offensive firepower of both sides shone bright under clear skies on the afternoon of university football. Stingers receiver Kris Bastien was the star in this game, catching six passes for a whopping 242 yards and two touchdowns. Gaiters quarterback Jordan Heather paced his offense and rallied his team from down 20 points at the half to within three points of the lead in the fourth quarter. Heather threw for 387 yards and four touchdowns, with three of them going to receiver, David Haddrall. However, he also threw four interceptions, three of which came in the fourth quarter. The Stingers got off to a good start, taking a 31-11 lead going into the half, highlighted by several spectacular catches by Bastien, the most notable being a 103-yard catch and run in which Bastien caught a pass from Quest across the middle and turned on the jets to outrun the Bishop’s defenders on his way to the end zone. Quest had a solid game of his own, completing 17 of 31 passes for 339 yards to go along with two touchdowns and one interception. The Gaiters mounted a slow but steady comeback in the second half, coming closest with under than two minutes left in the fourth quarter when Heather brought out the offense at the Bishop’s 30-yard line with 1:46 left in the final quarter. After throwing an incomplete pass, Heather was picked off by Stingers linebacker Travis Bent, turning the tide back in Concordia’s favour. McGrath admitted that he was looking to play a more conservative style in the second half, with the hopes of controlling the ball on offense—and while it ultimately worked, it almost came back to haunt the Stingers. “The start of the second half was important, obviously,” said McGrath. “I thought offensively we got into a position where we got a lead and we wanted to be careful. Kadeem Vaillancourt, Kevin Prempeh and Nathan Taylor picked off Heather’s other three passes. Linebacker Chris Walcott led the defense with 7.5 total tackles, and Eric Noivo turned in a solid performance on the defensive line, picking up the team’s only sack of the game. “I thought we played pretty well,” said Taylor, who was playing his first ever regular season game at the safety position. “A little ‘bend but don’t break.’ There are a few things we have to clean up in film to make sure we’re ready for next week. 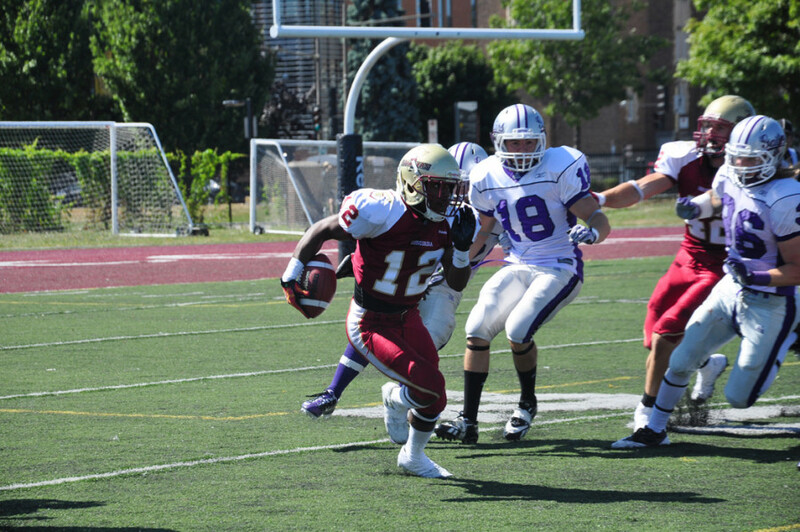 McGrath noted that there was a lack of a pass rush against the Gaiters, and hoped that the return of several injured players along the defensive line will be able to return for the team’s second game of the season against the Université de Montréal on Sept. 7, marking the first of three consecutive road games for the Stingers.